Did you get your sun vitamin D today? There is a curious problem with vitamin D and sun that science observed. people who spent a lot of time on the beach of Hawaii were still vitamin D deficient. There is a simple answer. The same reason the sun bathers did not get enough sunshine vitamin D offers a clue to what we need to do. In clinical research Why A Little Sun May Not Be Enough it was found that exposing ourselves to the little sun in the winter months, on its own, may not increase our vitamin D levels. Why? Science knows that for our hormonal systems to work properly, we need to have proper hydration. For our skin to produce the vitamin D, it needs to be properly hydrated. Drinking water alone has a diuretic effect. Simply drinking water is not enough. We also need salt dissolved in our mucous membranes so it gets into the blood in order to get the water to the cellular level. This is the place where the vitamin D is made. Tip: If you burn really bad but hate the idea of sunscreens, some have found that NAC (n-acetylcyesteine) prevents sun burns. It has a 12 hour half life. So, it needs to be taken the night before the trip to the beach. Then the morning on awaking. Then again around 10AM to Noon. Do not exceed dosing on the bottle. Although safe when taken in recommended doses, overdosing can cause severe health problems. This has to be done at the same time as using the water cures protocol. Test it out on yourself on a weekend at home first. We Don't Get Enough Sun By Choice Because we prefer instant gratification, because we want a pill instead of persistence, we may fail to get our essential vitamin D from the sun. Even though it is free, we tend to not take the time or inconvenience to get the most of this essential nutrient that comes from exposure to the sun. Actually it is not free. It costs time. It requires us scheduling at least 20 minutes outside in the sun a day. If sun induced skin cancer is a concern, then we can put your concern to rest too. We will cover that at the end of this section. We Don't Get Enough Sun Because of Circumstances: In nursing homes, it is not a priority to get grandma outside in the sun. Weakness or work may prevent us from getting the sun. Vitamin D3 supplements may be our only choice. Add to the circumstance challenge of getting enough sun and vitamin d, the record cold experienced across the USA early in 2014. For many, it was not possible to get enough sun. Sunblock Challenge: For some, there is a need for sunblock. They get sunburns at the thought of going out side in the sunshine. Aside from the various chemicals they are exposing themselves to, they are limiting sun vitamin D.
But the worse reason for sun vitamin D fail, not being properly hydrated. More on Fluid and Electrolyte Imbalance: As mentioned above, at the same time some of us are not getting enough sun, others are out and in it but not benefiting. Are you a sun scientist? Many are doing their own clinical trials on the effects of solar radiation on their bikini clad skin. They are getting first hand research, using themselves as test subjects in premature aging and playing the odds in our risk of skin cancer? What if there was a better way for both? What if we could get better sun vitamin D production from our little exposure? If we are in the sun a lot, what if we could get more vitamin D and lower our risk of being old looking when we are still young? If you have relatives living in a nursing home, they even more than we, need sun vitamin D. Chances are, they get almost no sun light. To make your and their personal sun vitamin D exposure more effective, simply add to your daily routine the the Water Cures Protocol. Vitamin D is not a vitamin at all. It is a steroid that our body produces. It is produced in our skin. Our body regulates the water we store inside us from the areas of least needed to the most needed. If your body is saying your blood needs the water more than your skin for some reason, guess what is going to happen to your skin when exposed to the sun. The protective benefit of hydrated skin is gone. The skin, now more vulnerable because of a lack of hydration and certain minerals, can experience even more damage. And as with most radiation, it causes cellular mutation which results in cancer. Vitamin D, for good reason, called the sunshine vitamin We can get some from foods but most of our vitamin D is mainly produced by the action of direct sunlight on our skin. And vitamin D is controls a gene carried by people with multiple sclerosis. High levels may decrease the need of a cesarean in pregnant women. High levels may improve brain function. Low levels of vitamin D increase the risk of certain cancers. Higher levels may reduce the risk of diabetes. Higher levels may lower the risk of heart disease. If you are sensitive to the sun and need sun screen, there is an option. Your high risk of sun burn may be because of fluid and electrolyte imbalance. Improve your salt intake and your water intake and you may lower your sunburn risk. There are other alternatives that are being researched. Use of bioactive whey protein isolates along with N-Acetylcysteine may be beneficial to reduce the risk of sunburn. Melanoma, the most dangerous of the various types of skin cancer, has a rate increase almost 4 times since the 1970's. Along with vitamins K, A, and E, the vitamin D supplement may be toxic if you take in too much. 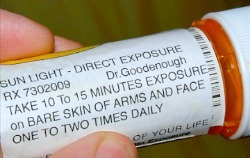 However, you cannot get an overdose on vitamin D from your exposure to the sun. Our body only makes what we need. What about winter time and the lack of sun exposure in our daily lives. Oily fish like salmon and sardines have vitamin D. Milk and eggs have vitamin D as well. Before taking supplements, speak to a healthcare professional. In most cases, only women who are pregnant or breastfeeding, those over 60, vegans and vegetarians will need to supplement. If you are dealing with other health challenges, you also may need it. Remember, the water cures protocol enhances your ability to make it. Vitamin D and sun exposure work synergistically to help you absorb calcium. These also help you to produce glutathione. The NAC above helps you make glutathione. This is our primary protector from sunburns. Glutathione also helps to fight and protect us from cancers. Hundreds of studies have looked at how glutathione can eliminate cancer. Boosting your vitamin D along with properly hydrating your body can help boost glutathione and prevent cancer. More Info on Foods High in Vitamin D and Glutathione. More on Vitamin D and Depression.